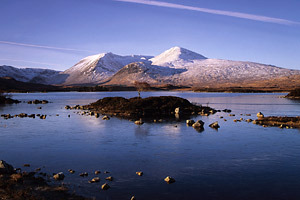 Stob Ghabhar, from Loch Tulla.Stob Ghabhar, from Loch Tulla. Ben Lomond, from the summit of Meikle Bin, Campsie Fells.Ben Lomond, from Meikle Bin. The Luss Hills, the Arrochar Alps and Ben Lomond, from Auchineden Hill.The Arrochar Alps and Ben Lomond. Loch Tummel and Schiehallion, from Queen's View, Perthshire.Queen's View, Perthshire. 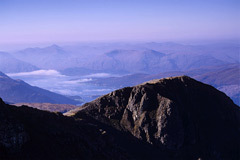 View south-west from the summit of Na Gruagaichean, over Kinlochleven and Loch Leven.Kinlochleven and Loch Leven. Ben Nevis and the Mamores, from the summit of Sgorr nam Fiannaidh.Ben Nevis and the Mamores. 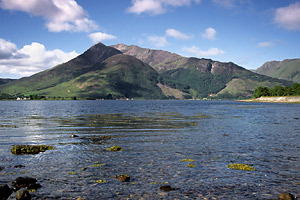 Loch Duich and the Five Sisters of Kintail.The Five Sisters of Kintail. Beinn Alligin and Beinn Dearg, from Spidean a' Choire Léith, Liathach.Beinn Alligin and Beinn Dearg. Welcome to Scottish Mountain Landscapes! I am a keen hillwalker and amateur photographer, and over the years I have taken many photographs on my walks throughout Scotland. This website contains a selection of them. This is a new updated version of the site. It still runs on the Joomla! content management system, but now with a new responsive template. On desktop PCs, the site looks much the same as before. However, the new template is much more compatible with mobile devices. I've organised the photo galleries according to geographical area. Click on the links in the "Galleries" menu at the top of this page to access them. In each gallery you can enlarge the preview images by clicking on them. If you wish to view all the photos in sequence, use the next and previous navigation buttons. There are a few extra photos which don't appear on the gallery preview pages- look carefully through the galleries to find them. You can also view the extra photos by typing the word extra into the search engine. 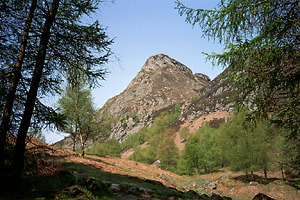 Most of the photos on this site are of mountain landscapes. 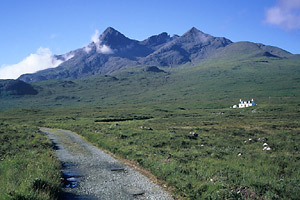 However, Scotland also has some superb coastal scenery, particularly on Skye, and this is reflected throughout the site. An t-Sròn, from Bidean nam Bian, Glencoe. 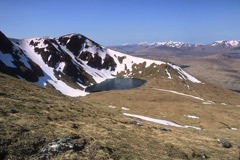 Coire an Lochain, from Beinn a'Chreachain. 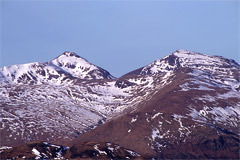 Stob Binnein and Ben More, from Benvane. Ben Venue and Loch Katrine, from the summit of Ben An. Meall Mor, from Loch Lubnaig. I hope you enjoy my website. If you have any comments you would like to make about this site, you can contact me directly using the contact page. Please note that all material on this website is copyright Allan Webb. © Copyright 2019 Scottish Mountain Landscapes.